Look no further than Atom Systems Private Limited’s Web Portal Design that helps your business have a digital face and works seamlessly across platforms to enhance user experience. The concept of web portal design has always been around but the recent developments in UI and UX have brought a clear transformation in the needs and requirements of a web portal. Our team creates professional web portal designs that blend with the user needs. Your internal team or clients will not have to go through a new learning curve to adapt to our responsive web designs. They are absolutely intuitive. Being a leading web portal design company, we ensure that our website’s interface is not just up to the mark but exceptional in design. Users never come across any glitches or break in pathways while browsing. Our way of working is unique and our web portal designs are a testimony to our quality standards. When we propose a web portal design to our clients, we ensure that it has functionality and practicality at the same time. It is created after thorough research of workflows and ensuring right content to the right audience. Our team synchronizes the content with existing internal systems in such a way that your operations are smooth and the data is secure. Opting for a web portal means cutting your operational cost and saving time by centralizing all the business processes. 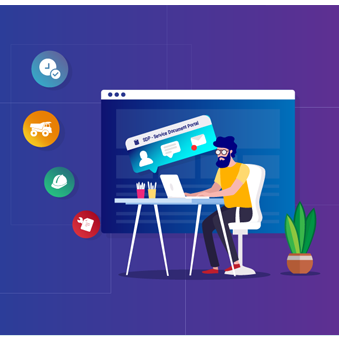 This gives you extra control, extra connectivity and ultimately, extra revenues in the end by anchoring your organization to a single platform. At ATOM Systems Private limited, we can use our expertise to optimize your costs. We bring you the best of technology and people to address your web portal design needs. We make our designs highly accessible which in turn improves employee’s productivity. ATOM Systems Private limited offers affordable web portal designs to companies worldwide and has empowered them to expand their business. We help maximize your sales by making your interactions more effective and secured. Our experience over the years has augmented our knowledge and polished our skills making us a top-notch web portal design company.